More news just in from James Munn at Fraser Yachts as he signs the 23.99m explorer yacht Archimedes for sale in a joint listing with Eugene Kilanov at Triumph Yachts. Built by Cantiere Naval di Pesaro to RINA class in 2006 and refitted in 2012, she's one of the yard's Naumachos series. Archimedes has been designed and built with the intention of having as little impact on the environment as possible while still allowing the ability to travel in comfort with luxury accommodation. She sleeps eight guests in a master suite, VIP stateroom and two twin cabins and a powerful 550hp Baudouin engine gives her a transpacific range of 4,500 nautical miles. 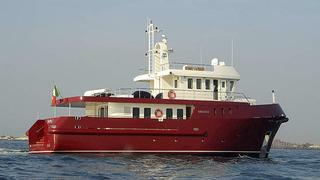 Lying in Genoa, Archimedes is asking €4.2 million.